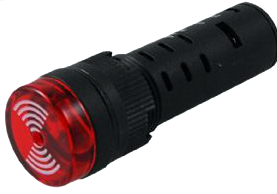 HMBE 24Volt LED Warning device convienently featuring an inbuilt buzzer. Typically used as an alarm or indicator in automotive applications. When DC voltage is applied, the LED and buzzer pulse for maximum impact.